Recently, the Hog Roast Lytham were hired by a new client to host a surprise joint 30th birthday party for David and Dewi. The event was hosted at Sports and Social Complex in Brymbo, Wrexham which was slightly out of the Hog Roast team’s usual catering area. 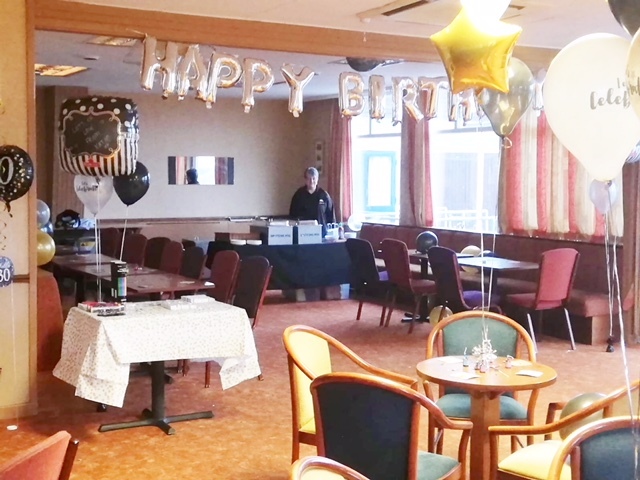 However, the team were excited to travel that extra mile to ensure that they helped the new client to host the most fantastic birthday party. The venue was beautifully decorated for the occasion and looked fantastic for the event. In addition, it was easy for the team to set up at the venue due to their fantastic flexibility and easy-to-set-up equipment. The client selected a classic hog roast which consisted of a whole slow roasted hog on site in one of the team’s Hog Master machines by the Hog Roast Lytham team’s catering manager. Alongside the centrepiece hog roast, crispy crackling, homemade stuffing and classic apple sauce were served along the buffet. The perfectly seasoned meat was served on soft bread rolls and a variety of wraps which were served with an arrangement of sauces. The vegetarian option consisted of lightly grilled vegetable and halloumi skewers which went down a treat with the guests. Overall, the buffet was served to sixty people, a perfectly sized party for the catering provided by the Hog Roast Lytham team. The food was served at 8:30 pm and the Hog Roast team arrived a few hours before the desired serve time in order to prepare all of the locally sourced ingredients on site. This is a great characteristic of the team as it ensures that all of the food tastes fresh and flavourful. In addition, all of the food was cooked on site so that it could be served hot, straight from the team’s catering machines and into the professional heated metal trays which the team provided. The service was led by the Hog Roast Lytham team’s Catering Manager, James, who oversaw all of the cooking and preparation. In addition, James ensured that all of the food was beautifully presented and that all of the food was uniform. Corporate Christmas Dinner – Hog Roast Egremont!